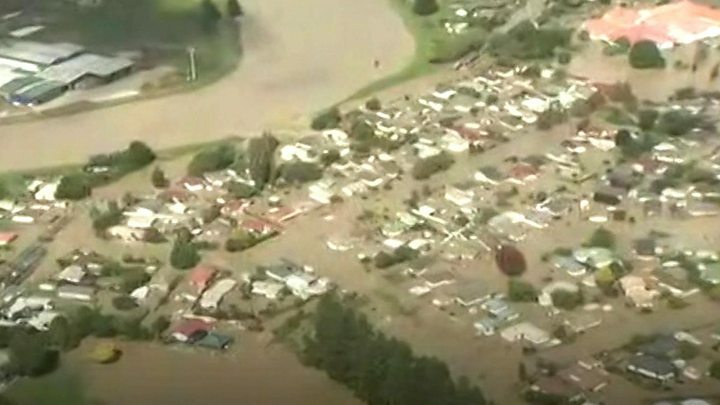 The entire town of Edgecumbe on New Zealand's North Island has been evacuated, after severe flooding. About 600 homes and 2,000 people are affected, as tractors and boats helped take locals to safety. The rain, caused by the remnants of Cyclone Debbie, which hit Australia a week ago, has caused a river to burst its banks. The mayor has described the extreme weather as a once-in-500-years event. Heavy rains also flooded roads in Wellington, the capital, and went on to soak New Zealand's South Island. In Edgecumbe the water is said to be as high as 2m (6.5ft) in some areas. Police have erected barriers to prevent residents from returning. Police are searching for one man believed missing in floodwaters near the swollen Waikato river. They have denied social media reports of looting but say they will patrol the area anyway, after locals raised concerns. While the evacuation of Edgecumbe is largely complete, the emergency services are still evacuating dozens of residents from the nearby Whakatane suburb. Parts of the Bay of Plenty area received up to 250mm of rain in the last 36 hours, the New Zealand Herald reported. "We had to evacuate, (the) house is totally flooded now. We're not sure how bad it's going to get," one resident told Reuters news agency. Deputy Prime Minister Paula Bennett told reporters that the authorities' message to affected residents was: "Get out and stay out." Kaikoura, the town cut off from the outside world by an earthquake in November, was once again isolated as landslides blocked roads. Rainfall has eased across most of New Zealand's North Island. But former Cyclone Debbie is still having an impact in Australia, where severe flooding hit the town of Rockhampton, inundating hundreds of homes. The category four cyclone has left at least six people dead.